Congratulations are in order for Redmond’s Black Raven Brewing. At this past weekend’s Great Alaska Beer & Barley Wine Festival, they won 1st Place for their vintage 2010 Old Birdbrain Barleywine. This is actually the second year in a row that Black Raven has taken top honors at this prestigious festival; they won with their 2009 vintage last year. 2009 was the first year that Black Raven was open for business, and they have now won this festival with each of their first two vintages of barleywine they have produced. That is quite an impressive feat as the festival lineup includes many great barleywines, from classics such as Anchor Old Foghorn & Sierra Nevada Bigfoot, to offerings from Alaskan breweries like Sleeping Lady, Last Frontier, Midnight Sun, and Glacier. If you’d like a taste of this award-winning barleywine for yourself, make sure to mark your calendar for the upcoming Barleywine Bacchanal at Beveridge Place Pub from February 25 to March 3, and the Hard Liver Barleywine Festival at Brouwer’s Cafe on March 3. Black Raven is hoping to have some pouring at those events, and Beaux said they’ll likely throw a keg on at the taproom very soon also. Firestone Walker Brewing took 2nd place at this year’s festival, while Silver Gulch Brewing from Fairbanks, AK rounded out the top 3. We had a great time in Anchorage and at the Festival. 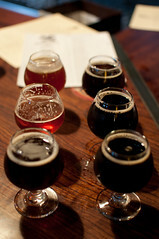 It was also Beer Week so all the breweries had barrel aged beers on draft – yum! Sleeping Lady/Snow Goose was our favorite place to hang out downtown, and Midnight Sun on the southside. Are the full results posted anywhere from GABBF? Can’t seem to find anything. I believe Kodiak Island Brewing won the Winter Ale category with their Island Trails Spruce Tip Wheatwine. Silver Gulch was third in the Barleywine Category with The Weird Beard, Firestone Walker Abacus was second and Old Birdbrain first.